Salvador 2005 � For the first-time outside of Rio de Janeiro, Brazil will host a double gender SWATCH-FIVB World Tour event in Salvador, the capital of the state of Bahia and former capital of Brazil until 1763. Salvador hosted a men�s event for the first-time in 2004 while women�s SWATCH-FIVB World Tour events were held four years (1996-1999). Teams from Brazil won all five gold medals. Salvador is literally surrounded by beaches and is famous for its history, its hospitable people and the legacy left by people from other continents. For a start its shore is one of the longest in Brazil, including 34 kilometers of beach, spreading across Cidade Alta and Cidade Baixa. The beaches located between Cidade Baixa and Porto da Barra are bathed by the calm waters of Todos os Santos Bay and the others by the Atlantic Ocean. Salvador looks onto a bay, the Ba�a de Todos os Santos, and is ringed with beaches and dotted with tropical islands. To the northeast of the city a string of fishing villages lies along a beautiful coastline � in short, no lack of places of inspiration. Women - Brazil placed six teams among the top seven finishers in the 2004 season finale in Rio de Janeiro. Brazilian women have won all four of the previous Salvador events, including three by Adriana Behar and Shelda Bede. Ana Paula Connolly and Sandra Pires, the 2003 SWATCH-FIVB World Tour season point�s champions, won their only 2004 event in Rio. The 2004 title was Pires� third in Rio de Janeiro as the women�s from the host country have now five of the seven previous events. Pires joins Adriana and Shelda as earning medals at each Salvador stop. Pic: FIVB President Ruben Acosta with the Athens 2004 silver medalists Shelda Bede and Adriana Behar. Men - The SWATCH-FIVB World Tour returns to Salvador for the second-straight season as the host country hopes to reverse its fortunes from the 2003 season finale in Rio de Janeiro where no Brazilian men�s team earned a podium place. It marked the first-time in 26 FIVB events in Brazil where the host country did not secure a medal. 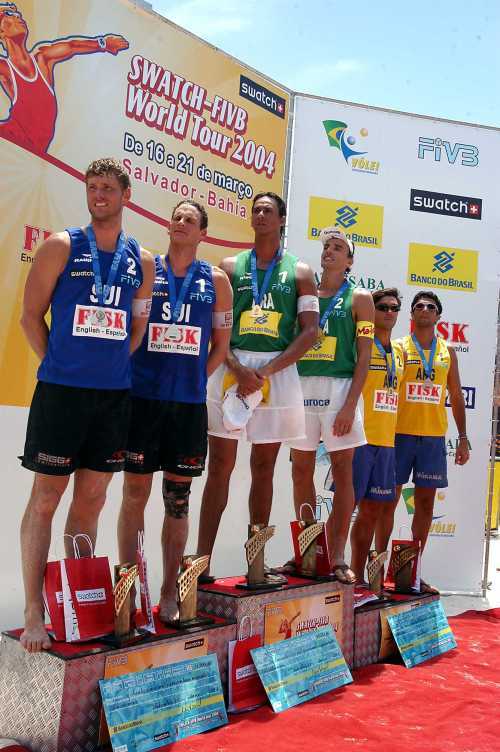 With Markus Dieckmann and Jonas Reckermann of Germany winning the 2004 season finale in Rio de Janeiro, it also snapped a streak of 11-straight gold medal finishes by the men from Brazil on their home sand. The Germans defeated Patrick Heuscher and Stefan Kobel of Switzerland in the Rio gold medal match, who lost to Emanuel Rego and Ricardo Santos of Brazil in the 2004 Salvador final. Emanuel and Ricardo defeated the Swiss pair in the Athens semi-finals enroute to the Brazilians� gold medal finish in the 2004 Summer Olympics. Pic: (from left to right) - Heuscher, Kobel, Ricardo, Emanuel, Conde and Baracetti.